Razer has long touted its Chroma lighting – those RGB LED lights that you find on keyboards, mice, cases and laptops like the new Razer Blade Pro – as the next step in immersion. And while synchronized lighting does add a certain je ne sais quoi to games like Overwatch, Diablo III and Call of Duty Black Ops III, flashing lights don’t hold the same potential that Razer’s next device, Project Ariana, does. 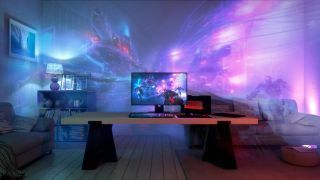 Revealed to the world at CES this year, Project Ariana is a 4K projector concept developed by Razer that expands your field of view in your favorite game by using the area around your gaming monitor as an extended screen. During a demo with the product, Hilmar Hahn, Associate Director of Product Marketing at Razer showed us how Project Ariana could make first-person shooter games (in this case Shadow Warrior 2) more exciting to play when they filled your whole field of view instead of being relegated to your tiny monitor. The demo consisted of someone sitting in a chair a few feet from the TV. As usual, lights flashed on the Chroma-enabled keyboard and mouse when he used special attacks or suffered heavy damage. Been there, done that. But then Razer turned Project Ariana on and suddenly the area around the TV – what was just a grey wall a few minutes ago – into an extension of the screen. Enemies that you couldn’t see a few minutes ago now appeared in our peripheral vision, and while they weren’t as well-defined as they were on the screen in front of us, having an expanded field of view certainly reduced the time needed to locate your next target. Hahn explained that Project Ariana uses the same Chroma SDK that developers have been using for the last few years to make special effects for Chroma-enabled devices like mice and keyboards, and therefore he thinks developers won’t have much of a problem taking their games from the monitor to the living room wall. Currently, however, there’s just one game that supports the still-in-development technology, and that’s Flying Wild Hog’s Shadow Warrior 2. Hahn told us that the technology was in the hands of several developers already and while he couldn’t tell us exactly when we could expect more partnerships to be revealed, he did say several big publishers were already on-board. The demo we saw at the show was an impressively effective one. Not only were the keyboard, mouse and Project Ariana all synced-up together, Razer also installed a few smart lightbulbs in the room that also integrated with the Chroma SDK. To that end, another announcement Razer made at the show this year was that Chroma itself is expanding outside of gaming and would now include products from Lenovo, NZXT, Antec, Lian Li, Wicked Lasers and Nanoleaf. Razer's booth at CES was our first look at the Chroma-connected living room. For some there’s a chance the vision Razer has for Chroma is sensory overload – it was almost overwhelming to be in a room that had lights that pulsed every time the character on-screen was hit or used a special. For others, however, Chroma smart home products and Project Ariana are the perfect opportunity to create the gaming den they’ve been dreaming of. Unfortunately though, for the time being Ariana is just a concept – Hahn had told me that it could be “2017 or 2018 when the product comes out, but we’re going to wait until it’s ready.” What that means is that it could be years until you see the Chroma-connected living room. The other problem we saw with Ariana is that 4K projector prices are far out of reach of most budget-minded gamers. 4K projectors from companies like Sony, Optoma and others start at around $10,000 (£8,000) and most are about double that at around $25,000 (£20,000). If Razer could find a way to cut the cost of the 4K projector and bring on some big-name developers (can we please get the next Elder Scrolls game on here, please? ), Project Ariana might be the next-level immersion non-VR gamers have been waiting for. If it doesn’t, well, here’s to another CES where Razer was willing to think outside of the box.